2 Version: 00; Status: E Seite: 2/7 Attention: As a customer you have an account via password. This account includes the authorisation to read documents in all your project files. 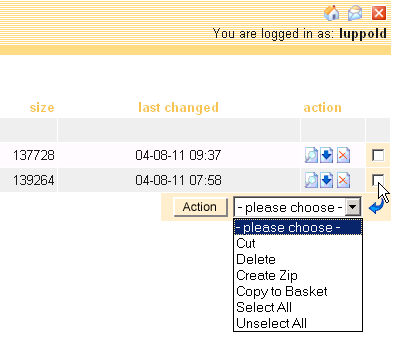 Write-access exists only for the folder File transfer. The project manager of the customer company is responsible to give access to the project members of his company. 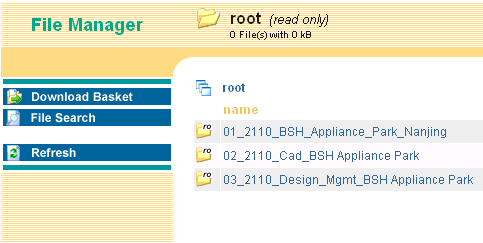 After successful login you will see the File manager. 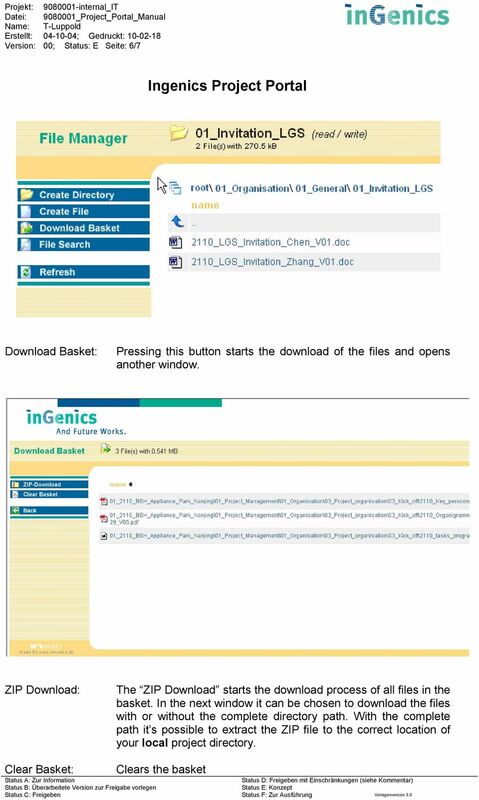 Here the project folders are shown. 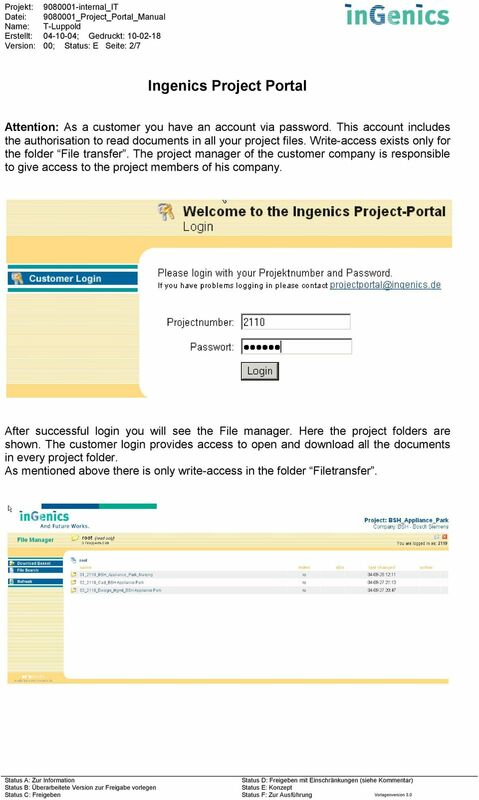 The customer login provides access to open and download all the documents in every project folder. 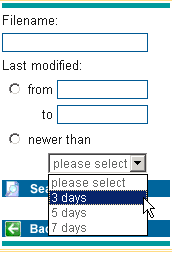 As mentioned above there is only write-access in the folder Filetransfer. 3 Version: 00; Status: E Seite: 3/7 Folder without write-access are marked with ro (read only) located on the folder symbol. 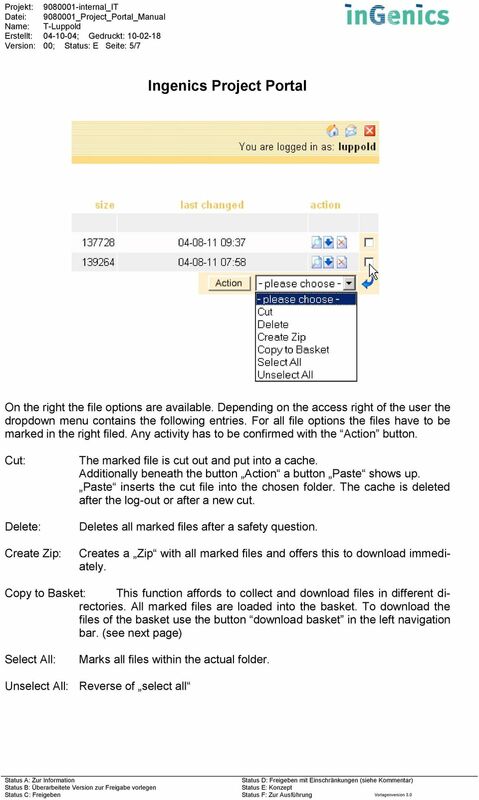 In the navigation bar on the left there are the following Buttons: Download Basket: File Search: Refresh: Contains all files you have marked to download. To open the search window. All sub-folders of the marked folder will be scanned. Refreshes the actual Website. 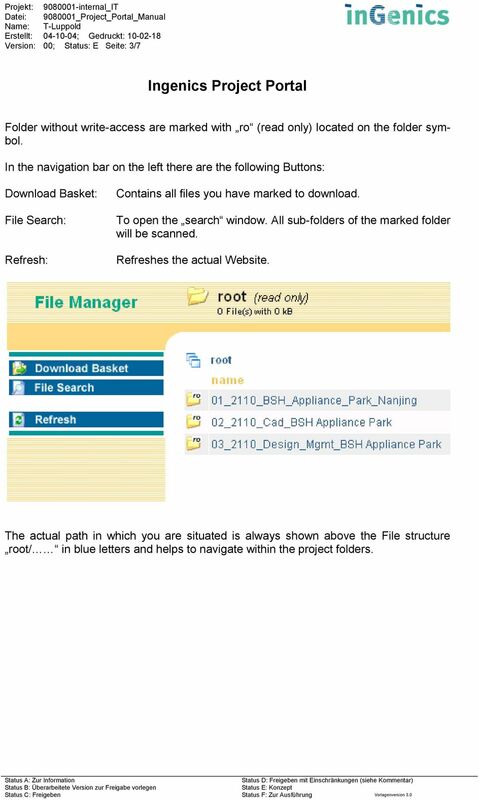 The actual path in which you are situated is always shown above the File structure root/ in blue letters and helps to navigate within the project folders. 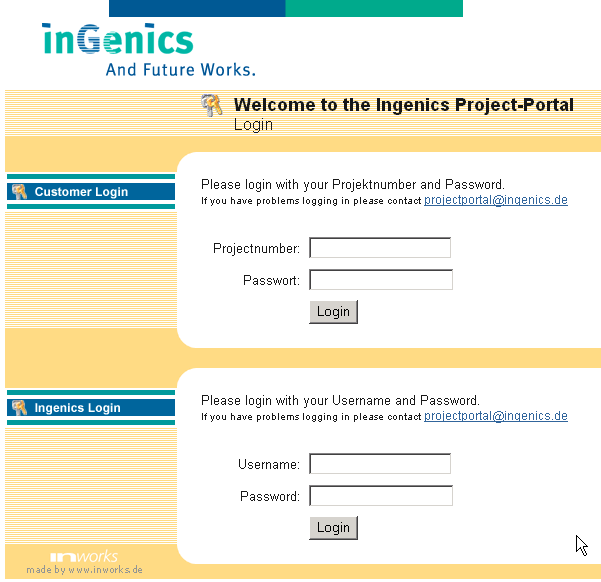 4 Version: 00; Status: E Seite: 4/7 For folders with write-access the navigation bar is extended with two additional buttons. 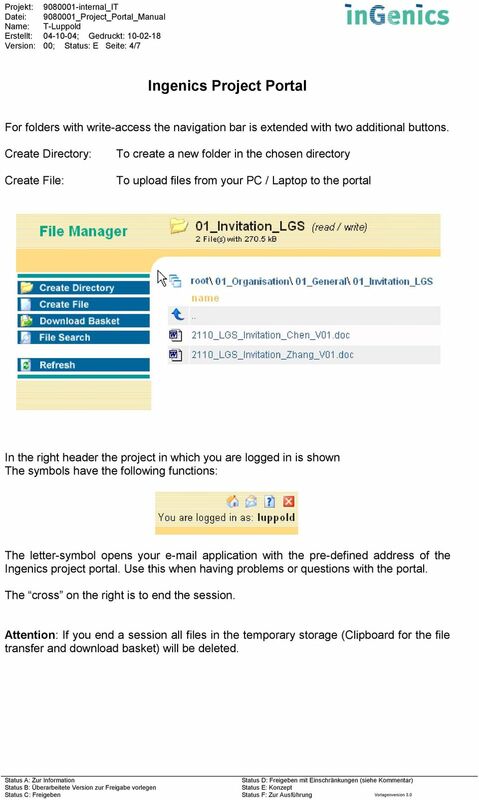 Create Directory: Create File: To create a new folder in the chosen directory To upload files from your PC / Laptop to the portal In the right header the project in which you are logged in is shown The symbols have the following functions: The letter-symbol opens your application with the pre-defined address of the Ingenics project portal. Use this when having problems or questions with the portal. The cross on the right is to end the session. Attention: If you end a session all files in the temporary storage (Clipboard for the file transfer and download basket) will be deleted. 7 Version: 00; Status: E Seite: 7/7 The search option affords to search files within the project. Use the common * to replace characters. For advanced search the pre-defined search options are provided. General remarks: Use exclusively the navigation buttons within the project portal, NOT the buttons of your internet explorer like back or refresh and NOT the Enter button of your keyboard. Zip-files are standard stored with a path indication. 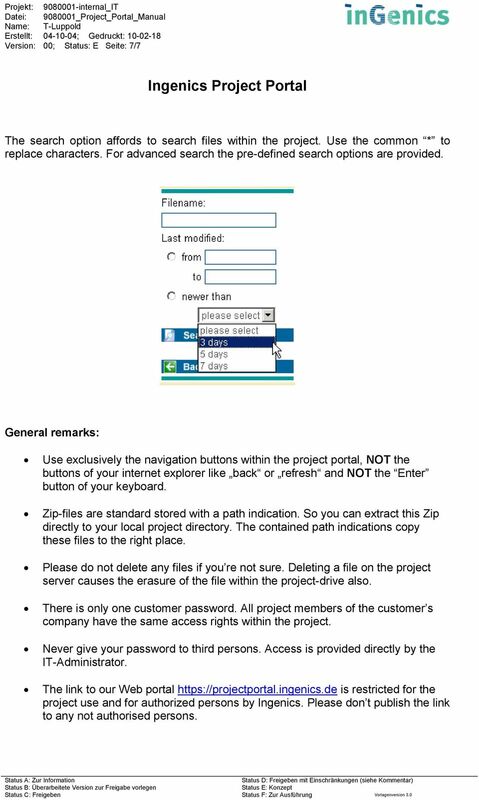 So you can extract this Zip directly to your local project directory. The contained path indications copy these files to the right place. Please do not delete any files if you re not sure. 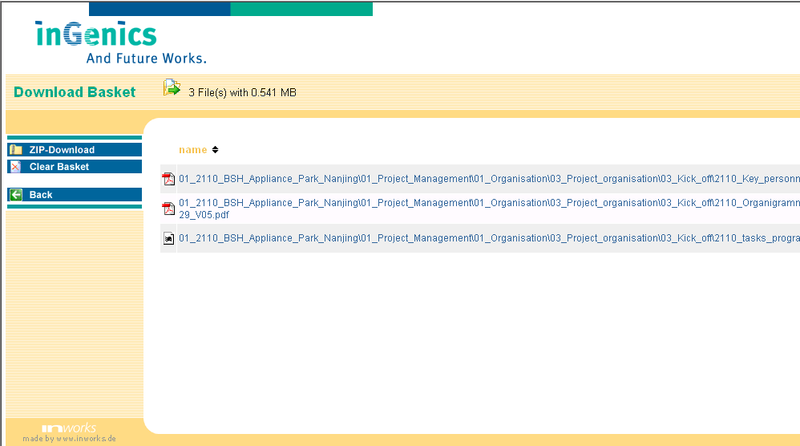 Deleting a file on the project server causes the erasure of the file within the project-drive also. There is only one customer password. All project members of the customer s company have the same access rights within the project. Never give your password to third persons. Access is provided directly by the IT-Administrator. 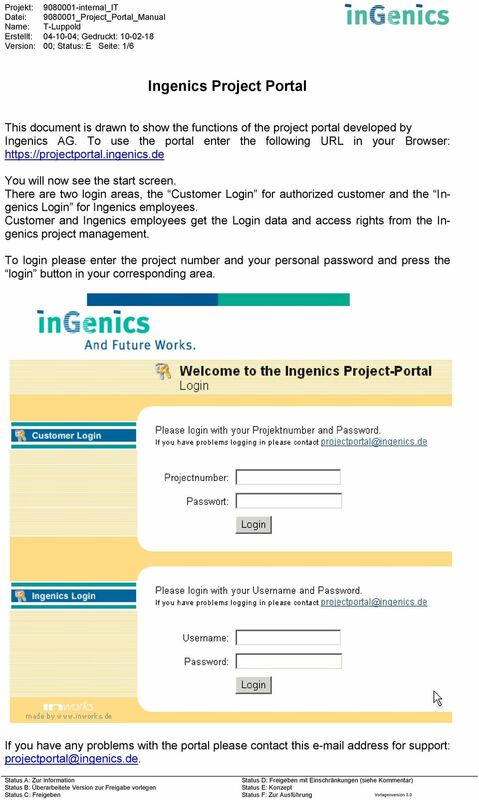 The link to our Web portal is restricted for the project use and for authorized persons by Ingenics. Please don t publish the link to any not authorised persons. Wählen Sie das MySQL Symbol und erstellen Sie eine Datenbank und einen dazugehörigen User. 1 English Description on Page 5! German: Viele Dank für den Kauf dieses Produktes. Im nachfolgenden wird ausführlich die Einrichtung des Produktes beschrieben. Für weitere Fragen bitte IM an Hotmausi Congrejo. In vier Schritten zum Titel. erfolgreichen Messeauftritt. Four steps to a successful trade fair. Hier beginnt Zukunft! The future starts here! p^db=`oj===pìééçêíáåñçêã~íáçå= How to Disable User Account Control (UAC) in Windows Vista You are attempting to install or uninstall ACT! when Windows does not allow you access to needed files or folders. Deutsch 1.0 Vorbereitung für das Firmwareupdate Vergewissern Sie sich, dass Sie den USB-Treiber für Ihr Gerät installiert haben. Diesen können Sie auf unserer Internetseite unter www.testo.de downloaden. Sepiola Mockups. Overview. Show notes. Primäre Navigation anklicken um zum gewünschten Mockups zu gehen. Backup usage. Overview. RailMaster New Version 7.00.p26.01 / 01.08.2014 English Version Bahnbuchungen so einfach und effizient wie noch nie! Copyright Copyright 2014 Travelport und/oder Tochtergesellschaften. Alle Rechte vorbehalten. Exercise (Part VIII) Notes: The exercise is based on Microsoft Dynamics CRM Online. For all screenshots: Copyright Microsoft Corporation. The sign ## is you personal number to be used in all exercises. Extract of the Annotations used for Econ 5080 at the University of Utah, with study questions, akmk.pdf. OMNITRONIC DSP Control Installationsanweisungen bis Version 1.3.1 Bitte befolgen Sie diese Schritt-für-Schritt Anleitung genau, nachdem Sie ein Software Update von unserer Website heruntergeladen haben.